It was nice to step away from the computer and homework for a bit yesterday for some ‘me’ time. This is what I did. It’s a stamp based on this card that I designed. 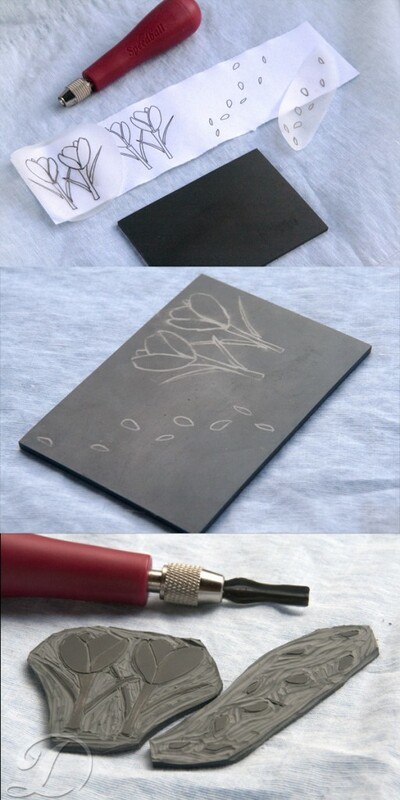 For an in-depth tutorial on carving stamps click here. All I need to do now is find a wooden block to mount these on and they’ll be ready to use. I used a much thinner and harder carving block for these stamps than I did for my button flower. Because there are delicate pieces to the design, I wanted a surface that was a little more robust than the more crumbly speedball carving block. Unlike the button flower, I do need to mount this stamp because it is so thin. If I don’t, then no matter on far down I carve the negative space, it will flop downwards onto the paper and muddy my print. I’ll post again when it’s mounted and ready to show off!